alternate title: I HATE NOISY TOYS! this post is not meant to be a gift guide — there are lots of cute ones out there right now, but to be completely honest i’m kind of minimal when it comes to gifts. don’t get me wrong — i love giving presents and i like to think that i give good ones! but i prefer to give a few nice items rather than a big ol’ pile. i also like to give [and receive!] useful/consumable gifts — just perhaps a step up or a more fun version of what someone might buy for themselves or their own child. concept, except we’ll have to do it x2 if we attempt to do the whole “8 nights of hanukkah” thing. [or x 4 when you consider 2 kids. did i say i was minimal? i still think i am, since most of these gifts will be books + necessary items]. ANYWAY. we got annabel nothing this year — not because we’re mean, but because she got gifts from her relatives, and because i buy her things all the time when it seems like she’s ready for them. i do, however, try to keep her toy collection on the minimal side. i cringe a little bit when i go into houses where there are just SHELVES and ROWS of things lined up everywhere, or scattered all over the place [shudder]. most kids who have that many toys will only play with a small fraction of them, and i much prefer open-ended toys that can be used in different ways [blocks, legos, art supplies] to a bunch of noisy plastic shiny things. and while we’re on the subject of noise — this also may make me a totally unfun parent or person, but i hate — and have always hated — noisy toys. toys that talk, sing, repeat phrases, say the alphabet — all. drive. me. crazy. i honestly don’t think they are necessary or any more fun than . . . quiet toys, and since they annoy me so much i am basically banning them from our home. or disabling them as noisemakers. annabel got a very cute doll the other day from her great aunt [which was so sweet!] but even she freaked out when the thing let out a cackling laugh any time pressure was applied to her stomach. i took the battery out, and . . . presto! 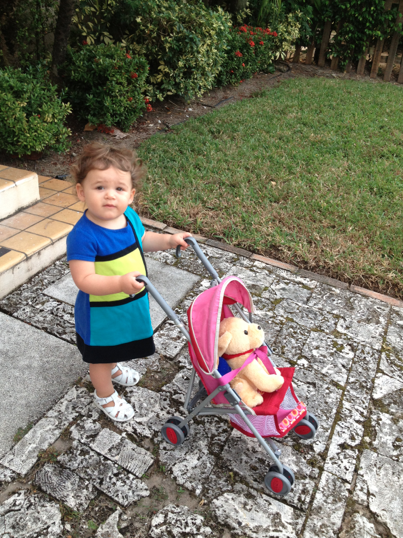 a sweet and cute doll that she now loves, looking relieved as she proclaims “no more sound” each time she sees it. with all of that said, here are a few things she DOES love right now. and that i do, too. play food [and utensils and cookware]. ours is all from IKEA! 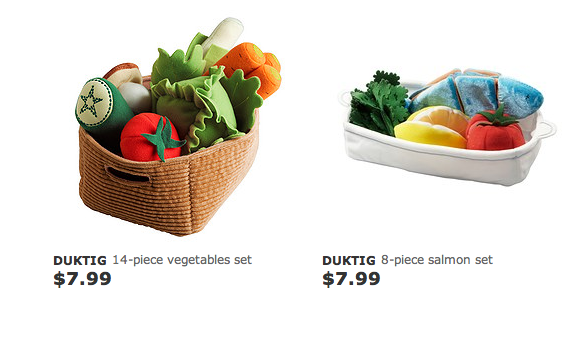 i love how the vegetable set includes a leek and lettuce leaves that come off! pro ball set. 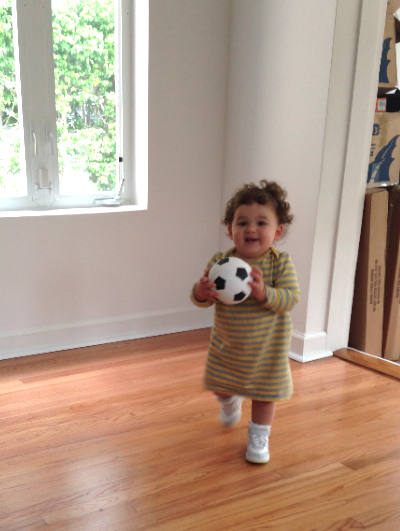 she loves attempting to kick and throw, even if she mixes up the soccer ball with the basketball. 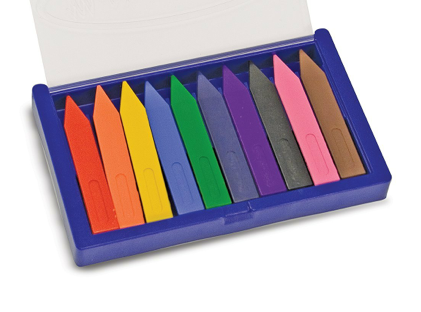 art supplies: melissa and doug triangular crayons, sticker pad [yes, i bought the unapologetically girly pink one], colored and white paper, sesame street coloring book. play stroller [mini-graco, or others]. we actually got this as a hand-me-down from a’s cousins. looking it up, the price tag has me reeling a little bit [$36!?] but she loves this. 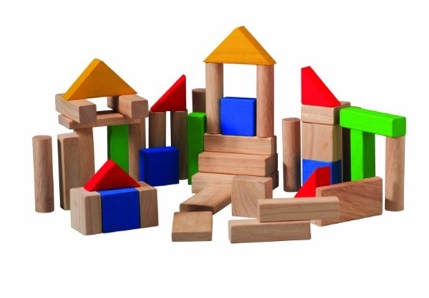 plan toys blocks. these feel so smooth and satisfying that i want to play with them, too. we also have a melissa & doug set that is great. she also has an assortment of dolls and stuffed animals [way too many] that she loves. honestly, between the items above and the menagerie in her bedroom, i think she’s set until at least age 5 or so. PPS: these are not affiliate links.